Summary: In this article I will discuss how our attempt to fix our education crisis has staggered from one approach to another. First we threw lots of tech at the problem, and this resulted in billion dollar failures. Then we threw lots of money at training teachers to use tech, and still we are seeing failures. It is only when we realise what is really wrong that we can effectively change how we teach. “Hi Craig, I wonder if you could come and talk to our teachers about using technology for teaching?” reads the email I've just opened. I receive many emails like this and so I'm fairly sure what I will find when I get to this school. I arrive and am soon set up in the school auditorium. Typically, the session is scheduled after school - often on a Friday afternoon. As the room slowly fills with teachers I can already read their expressions - “Why do they force us to attend these sessions?” - “Not another presentation on using computers”. As I stand up I can see most people are looking at their devices. I suppose that's what I'd be doing at an after school session like this. I lean forward and speak into the microphone. “The worst thing we can do is train teachers to use technology.” I pause. Heads pop up. I can see them replaying what I just said in their minds, wondering if they heard correctly. I can see the questions forming. “Wasn't this guy meant to be telling us how to use computers?” I wait for the confusion to take hold and then I continue. ​The second worst thing is doing nothing. I keep coming across articles that attempt to explain how we can fix the modern education crisis. Yes, there is a crisis. It doesn't take studies to tell us that our world has changed dramatically and our teaching hasn't kept up. Our students have a daily digital diet of approx. 9 hours of tech consumption. The impact is attention spans are reported to have dropped to 8 seconds - apparently below that of a goldfish. Whether this is true or not, what is true is that most teachers are struggling to keep students engaged. So how do we reconnect with our students? How do we make our teaching relevant in the digital age? The solution seems obvious. If technology is what engages the modern generation outside the classroom, then let's use it in the classroom. After all technology has revolutionized all other aspects of life - business, entertainment, communication, sports. It only makes sense that education needs the same revolution. And so our first attempt to fix our classrooms saw us investing billions in technology - iPads, Chrome Books, smartboards flooded into schools. And the result? At the best we could call it a mixed success. However, many would call it a failure. Headlines telling the costly story of the failed Los Angles iPad program or research proclaiming that technology in the classroom is reducing students' grades. That makes sense. Edtech is failing because teachers haven't been trained to use the technology. And that's why I find myself standing before this audience. This is our second attempt at addressing our modern education issues - throw money at training teachers to use technology. And once again vendors have been quick to respond to this by eagerly offering courses on how to use the plethora of tools that exist. But we have lost sight of something fundamental in our headlong rush to modernise education. It's not training teachers to use technology that we need, it's training teachers to teach with technology. Imagine some children enthused to bake their own cake after watching endless seasons of Master Chef. They're in the kitchen surrounded by everything they need - ingredients, equipment, and dollops of enthusiasm. After hours of mixing and beating, laughing and chatting, delicious smells are wafting from the kitchen. Finally, the moment arrives. The cake is ready. The oven is opened. You reach in to extract the delicious smelling masterpiece as the children look on fibrillating in anticipation. The cake is perf....flat! It is splayed across the baking tray inelegantly like a beginner skier on a ski slope. How could all their passion, ingredients, and tools result in this disaster? Quite simple - there was no recipe. And the same applies to education. Even the best technology mixed with enthused teachers and sprinkled liberally with the latest tech won't ensure success. I look back at my countless forays into using technology for teaching and how often it fell flat - despite my passion and belief that it would work. I recall one ambitious attempt in particular. I was so excited about the potential of 3D virtual worlds that I got my students to build a replica of our university - everything from the library to the lecture theatres. The detail was amazing. And so it was with great excitement that I stood at the front of a virtual lecture theatre prepared to deliver my first lesson. It took a while to settle them down as a flood of text streamed across my screen as the students “talked”. Finally, I managed to instil some order by SHOUTING (typing in uppercase) to make myself “heard”. Behind me the first slide of my presentation was displayed. “GOOD MORNING CLASS,” I typed. “TODAY WE WILL...” and so I began explaining what was on the slide. While the talking had eased off, students were still morphing into animals, flying, walking...I pushed on. I clicked “Next” to move to the next slide. Nothing happened. I clicked again. Nothing. Again. Suddenly the presentation jumped three slides. “Oh no,” I groaned hunched over my computer. It's not the tech. It's not the teachers. It's the missing recipe. In teacher talk the recipe is called pedagogy, but somehow we seem to have forgotten all about pedagogy. Somewhere in our enthusiasm to fix our education challenges technology has become a proxy for pedagogy . Herein lies our problem - where training teachers to use technology is assumed to be the same as training teachers to teach with technology. It's akin to assuming that because you know how to use a drill and nail gun you know how to build a house. Just because a teacher has been trained to use Google Docs, or YouTube, or Edmodo, does not mean they know how to teach with these tools. This begs the question. Why have we ignored pedagogy - something all student teachers learn about, something all teachers know is vital? Could it be that our digital education agenda is now driven by technology companies? In fact, why are technology companies telling teachers how to teach? Or maybe pedagogy has been forgotten because we are mesmerised by all the tools, or maybe it's our lack of understanding of how modern students learn. What we need, if we are going to realize the opportunities that technology can bring to education, is an easy-to-apply, effective, and appropriate set of digital-age pedagogies. Easy-to-apply - One of the most widely applied tools in education, because of its powerful simplicity, is Bloom's taxonomy of thinking. This ordered arrangement helps teachers easily align teaching and assessment. The same is required for modern teaching - an easy-to-apply taxonomy of digital age pedagogies. Effective - We can't simply copy our old pedagogies and paste them into the digital age. My failed virtual world foray is one example of why this does not work. In fact, there is a mounting body of research that points to the need for approaches that encourage active learning rather than passive consumption. We need effective approaches that encourage active teaching and learning. Appropriate - Our issues have arisen because our students are engaging, connecting, and learning in new ways. Appropriate pedagogies need to resonate with how our modern students learn and at the same time leverage the affordances that technology offers. ​What is required is not just digital age pedagogies but a Taxonomy Of Teaching And Learning (TOTAL) digital age pedagogies. Designing a TOTAL digital-age approach requires an understanding of how modern students use technology, as well as the intentional and unintentional affordances provided by technology. It was extensive research into this that gave rise to the Activated Classroom Teaching (ACT) model - the first cohesive taxonomy of digital age pedagogies. The ACT model provides educators with an arrangement of five active learning pedagogies for teaching in the digital age. These pedagogies allow teachers to focus on teaching then technology. So, why is training teachers to use technology the worst thing we can do? Quite simply because as our education issues continue and it's not the teachers to blame - as they have now been trained - it must be the technology to blame. And this is exactly what we are seeing in a new wave of reports proclaiming the failure of technology in the classroom. However the issue lies not with the technology or with our teachers, but with our training. “The worst thing we can do is train teachers to use technology...The best thing we can do is train teachers to teach with technology. I recently came across an article entitled “5 apps educators should use”, but in my enthusiasm I misread it as “5 apps educators shouldn’t use”. I must admit that I did a double-take for a moment. How could someone tell educators what apps not to use? It would really be bad to be an app on such a list… which of course got me thinking. Are there any apps that educators shouldn’t ever use? I think there are, but maybe not the ones you would expect. Here are 5 “apps” educators should never use plus 5 “apps” every educator must use. Topping the list of apps that should never be used by educators is apathy. There is no cure for apathy, and no hope for innovation in the classroom. It is understandable, however, how after being stuck in an industrialized system of education that is all about standardization and outputs, that many educators are apathetic. Yet the first thing we must make sure we get rid of is apathy! We must care. We must make a difference. We must act! Educators are humans too, even if students don’t always agree. We have hopes and fears, likes and dislikes, and all too often we are apprehensive when it comes to technology. Many educators may themselves have grown up BC (Before Computers) and even though computers are now a norm in our lives, they still feel foreign in the hallowed precincts of our classrooms. We are apprehensive about making mistakes. We are apprehensive about failing. We are apprehensive about what we don’t know. Don’t be! Apprehension is fine, as long as it does not stop us from moving forward. Anything new can be scary, daunting… otherwise it’s not really new. So, accept the apprehension, but don’t let it stop you from moving on to bravely explore strange new worlds… (Star Trek theme music now playing). OK, so we all like approval - we all thrive on validation. However, this is another app that we can’t have in our educator arsenal. You may get approval, but if you are seeking approval for trying new and innovative teaching approaches, you will be sorely disappointed. All too often the innovative educator is out on their own; think Dead Poets Society… Innovative teaching is not approved, and often it’s despised. Your validation will come from your students, from the look in their eyes when learning becomes meaningful. Don’t expect it from management or even other teachers… it’s lonely be an innovator, but the ultimate rewards are worth it. I’m not advocating bad manners, but being apologetic about what you’re trying to do, and your certain-to-arise failures, is to be avoided. I have a saying; “Try beta, you’ll teach better”. The web is built around the beta principle. Everything is in permanent beta, in a permanent state of improving. Google’s famous Gmail was in beta for many years, even with millions of active users. Why? Well, because they were, and still are, ever improving Gmail. There’s no apology for this, it’s how we grow. Trying new approaches will be fraught with failures. Quite simply, if you haven’t failed, you haven’t tried! Rather than apologize and eulogize, scrutinize, then galvanize, and move on to something beta and better. It’s at the end of the list of apps to delete... Which is where things we append tend to come. And this is exactly what we don’t want in the innovative educators’ app list. Innovating how we teach is not an afterthought; it is not an “end of list” item. It’s no longer a “nice to try if I have time”. We need a revolution in our education, and that means we need to rethink how we are doing everything we do, right NOW. It’s not simply about what we’ve always done with a bit of digital appended to the end. It’s about reimagining, redesigning, redoing how we teach. It’s not appending we need, but leading. It’s not more of the same tacked on the end, its innovating from the front. So as educators we need to carefully scrutinize our “apps” and make sure we have removed as far as possible from ourselves apathy, apprehension, approval, apology, and appendix. If we cling to any of these our best attempts at revolutionizing our classrooms, at reinventing our teaching, will be destined for failure. Delete these “apps” now! Click and hold them down, and when they wiggle - hit the X to delete. Hey, but surely we need some apps installed in our iTeacher life if we are going to be successful, right? Sure we do. So after removing the previous 5 apps from iTeacher, here are the 5 apps every iTeacher must use! Quite simply this is where it all starts; with the right approach. The approach of too many teachers to technology use in the classroom is what I call the copy/paste approach. We simply copy what we’ve always done and paste it back into our classroom with a digital coating. It’s much more than books becoming eBooks or blackboards becoming smartboards; it’s about activating our learners through the amazing affordances technology offers to learn through curation, conversation, correcting, creating, and even chaos. One of the strengths of technology is that is enables us to celebrate diversity - diversity of learning approaches and diversity of teaching strengths. Don’t simply use technology like everyone else does just because that’s what they do. Appraise your learners’ needs and your strengths, and then use technology in a way that will enthuse and enthrall you and your learners once more. Don’t be overwhelmed by the possibilities, rather choose one thing and give it a good try while resisting the desire to leap to the next latest craze. This “app” stands as both a verb (to take) and an adjective (what is suitable) - and these are both key in the educators app store. Take what is suitable and discard what isn’t. Shamelessly steal the ideas of other educators. Learn from their experiences. There’s too much to learn, too many apps to try; appropriate what’s appropriate, and you’ll save yourself loads of unnecessary time wastage. If we expect our students to learn from us, shouldn’t we learn from others too? I often end my training sessions with educators with this riddle: “There are three birds on a branch - one decides to fly away, how many birds are left?” We’d assume two… But because I’m asking the question the respondents assume a trick, so I get everything from 0 to 3 as replies. The answer I’m looking for is three. The fact that a bird decides to fly away is not the same as flying away. Deciding to innovate and transform our classrooms, while a great first step, is not the same as transforming and innovating our classrooms. The Apply app is vital if you want to change your classroom. Take a step, however small, you’ll be amazed at how easy it can be. We’ve all heard it. “Modern students are too distracted”, “This generation is lazy and overstimulated,” and so on. Sure these observations might be true, but rather than fixate on the symptoms, let’s appreciate the opportunities. Technology may be to blame for the crisis in our classrooms, but maybe it’s a crisis that was long overdue. We’ve taught in a production-based, instruction-led, industrial style since the invention of the printing press. Finally we have new and exciting opportunities to teach in new and exciting ways, brought to us by technology. Celebrate and appreciate the exciting times we are living through as we have the opportunity to teach in classrooms, in the midst of the greatest education revolution we’ve ever seen! Being an educator in our modern day and age is no easy task. We are living in turbulent but exciting times. When it all just seems too much, just remember - “Don’t worry, be ’appy”! Universities, the end of an era? #RhodesMustFall, #FeesMustFall, it’s obvious that we’re hearing the rumbles of discontent on our higher education landscape, but what’s not as obvious is that these are the warning sounds of a fast-approaching avalanche. It’s not the statues or the fees, that are the issues, but rather lies beneath - a common call, a common need for white and black, rich and poor to unhindered, equal access to quality education. It’s long been known that education is the surest route to liberation from poverty, inequality and injustice. Yet while we have made huge strides in our country in many aspects, our educational advances have been dismal. And so disruption and protest are becoming the voice of our students seeking change. Yet as Jonathan Jansen, the Vice Chancellor of Free State University, points out, these rights to protest may carry long-term consequences, as it did for the University of Zimbabwe, that destroys the very thing our students are seeking - quality education. Moving to a different chair in the face of an impending avalanche hardly seems like a sensible thing to do. Yet this is all that President Zuma’s “zero percent fee increase”, or moving statues, or renaming buildings, is doing. Let’s for a moment imagine not only the zero fee increase, but the goal of free higher education. Does this mean academic staff salaries, which are already low and lag industry levels, will further decline, causing more quality staff to leave? “Just as investors do not invest their money in chronically unstable societies, so too top academics do not spend their time on serially disruptive campuses. Parents who have choices send their children elsewhere for higher education, including out of the country, leaving behind moribund institutions where the only students and academics left are those who cannot move.” (Jonathan Jansen). The rumbles we’re experiencing are not unique to our country. First world countries, such as the USA also have a greater demand than there is supply of spaces at top universities. Yet while our students are excluded based on not having enough money, their students are given credit which saddles them with crippling lifelong debt. Education, the surest route to liberation, remains the sanctum of the wealthy, or those with access to vast sums of money. Yet at the same time as we are seeing a revolution on the campuses of universities, we are witnessing another revolution happening online. While students fight over access to limited resources on our campuses, online quality educational content has become ubiquitous as top universities like Harvard, MIT, and Berkley, amongst many others, provide their content for free. While our universities languish in the shadow of ancient statues and symbols, the online world has seen the rise of a digital behemoth - MOOCs - Massive Open Online Courses. “Massive open online courses are arguably the most revolutionary facet of higher education today. Building on the foundations of existing online courses, these classes are open to anyone, anywhere, with enrollments in the thousands, at some of the best colleges and universities in the country—all for free” (Katie Sluiter). MOOCs may have their problems, such as the impersonal nature of online, lack of feedback, and no accreditation, amongst others, but we need innovative thinking, not bandaid repairs of endlessly replicated old approaches. We need to rethink how we educate our students before the avalanche sweeps us all away. I lecture at a University, and more often that not I see half empty lecture theatres. Sure they’re full to start with, but quickly the numbers dwindle. Schedule a lecture early in the morning or on a Friday afternoon, and you could be lecturing yourself! Why? Students are not learning in the way they used to. Learning has moved from content consumption to conversation around content. Learning has moved from physical places to online spaces. Learning has moved from preset times, to anywhere, anytime. Learning has moved from dry lectures, to engaging media. Yet universities persist with approaches invented by Gutenberg and the printing press era. We are not going to solve our education crisis simply by dropping fees and statues. We need innovative solutions, otherwise what comes after #FeesMustFall…#EntryRequirementsMustFall, #ExclusionsMustFall, #ExamsMustFall? And why not, if the goal is equal opportunity for everyone to higher education. We can’t fix our education crisis by simply silicon coating our failing, outdated education institutes - we need to innovate, we need #OutTheBox thinking. This is not simply about installing SmartBoards, and handing out iPads. It’s time for a revolution…not in the streets, but in our minds. I have spent a lot of time explaining to teachers and other educationalists the need to shift our pedagogy from simply silicon coating old approaches to one that is more appropriate to the digital realm. We have to move away from our copy/paste approach where we simply copy our offline teaching approaches and implement them in the online world to an new appropriate digital pedagogy. Our copy/paste approach is not only failing but seriously limits the amazing opportunities of what we can do with technology. While I have been passionately trying to share this message and the importance of developing a new digital pedagogy, I am largely seeing inappropriate implementations of technology being lauded as great EdTech solutions. However, I was encouraged after reading an insightful post by TechCrunch writer, Danny Crichton, who while having spent his life working in Silicon Valley, was recently exposed to teaching for the first time. It’s amazing to me how unprepared I was for the actual pedagogical challenges of educating my students. He looked around for advice from lecturers and found it wanting. He then turned to technology to see what solutions Silicon Valley offered - after all, it's solved so many other problems, surely it is helping education move into the digital age? So I did what any person in the 21st century did, and I searched Google. It was here that it hit me just how basic our pedagogical thinking really is. And it's here that Danny puts his digital finger on the nub of the matter - pedagogy. We have not shifted our pedagogy to one that is appropriate to the digital age. And this is having serious consequences as we simply switch ebooks for books, videos for lectures, smartboards for chalkboards, and so on. This is not using technology for teaching, at best it is silicon coating old pedagogies to dress them up in the guise of a new approach. Despite all the technology gains made by students, educators have received just a handful of useful tools to help with better management of their classrooms and the learning process. There have been far fewer “revolutionary” attempts to transform teachers than to just entirely replace the education experience. Exactly! It's what Ken Robinson called for years ago in his famous TED talk. We need a revolution. Technology companies responded with a silicon coating. Teachers responded with passive acceptance. And now we have the biggest danger of all - we think the revolution is taking place as schools "transform" from the old chalk and talk to the digital world. Yet it's an illusion, an illusion that is in danger of killing the much needed educational revolution before it ever happens. This is a renewed call for the education revolution. It can't be led by technology companies that know lots about technology but little about education. It won't be led by tenured academics comfortable with their ancient teaching practices. It must be led by passionate teachers, intent on exploring strange new worlds, seeking out new pedagogies, and boldly going where no teacher has gone before. Educational Technology – The emperor’s new clothes? Our current education system is flawed, as has been ably highlighted by Paulo Frere and more recently Sir Ken Robinson. Our outdated industrial paradigm is no longer able to keep children engaged in a world of ubiquitous digital stimulation. The chemical “solution” of medicating learners into becoming compliant products on the education production line, is increasingly being viewed as not only dangerous and inappropriate, but also not addressing the real problem – the flawed system. Now schools are turning their attention towards a technological solution, one that may be even more disastrous than its forebear - one that bears many of the hallmarks of the emperor’s new clothes. While businesses have adopted technology for over a quarter of a century, schools remained largely unchanged and irresolute. As the pressure mounts from vendors offering “solutions”, to parents pointing to other schools, to decreasing attention spans of children, schools are suddenly scrambling to implement educational technology solutions and governments and industry are wantonly throwing money at this new “solution”. However, unlike business that instructed technology companies about their needs, schools are being instructed by technology companies about how they should teach. Now we are seeing the first signs of concern, as these technology solutions fail, and some in a grand scale as was the case in the failed Los Angeles iPad initiative. Already schools are glancing nervously at each other as they begin to wonder, “have we been sold the emperor’s new clothes?” This immediately leads to a cycle of blame – it’s the wrong technology, it’s the wrong strategy, it’s the wrong content. While all of these may be partially true, the issues are far simpler, yet far more critical. The impending failure of educational technology will be due to a lack of appropriate experts and an appropriate digital pedagogy. The lack of experts, may seem somewhat surprising, especially in a world where there is no shortage of experts. However it is the lack of appropriate experts that is the concern. Ironically schools are eagerly following the dictates of non-educational organizations to inform them about their area of expertise -pedagogy. This is somewhat akin to an aircraft manufacturer telling farmers how to farm because they want to use a plane for crop spraying. And so we are seeing a flood of schools using iPads, or rolling out laptops equipped with eBooks, and “valuable” learning videos, because the technology experts have told them to. The problem we have is that while technology companies understand technology and teachers understand teaching, we have few who understand technology-based education. The second core issue is the lack of an appropriate digital pedagogy. The heart of this problem may be put down to a single word – skeuomorphism. Most people have a natural aversion to the new, and so technology giants such as Apple, Google and Microsoft have long employed skeuomorphic design principles to soften our transition from old technologies to new ones. Skeuomorphism is quite simply the retention of the form of the old without its function. This is classically seen in smartphone cameras that click like a DSLR camera, or pages in an ebook reader that curl as they are turned like a paper book, or a diary app with a “leather” cover and bookmark. None of these elements has any functional value, but simply carry a resemblance to the form of the past, thereby imbuing the user with a sense of familiarity and comfort. However, it is the widespread adoption of skeuomorphic-based digital pedagogies that is causing technology-based teaching to fail. Schools are wearing their digital clothing, where they have the form of the offline world, with little valuable function in the online world. For example, lauding the use of ebooks as a remarkable implementation of educational technology. Besides saving trees, there is no difference in pedagogy. Or, applauding a school’s smartboard implementation, whereas they offer little teaching or learning differences to their old blackboard counterpart. Or, the enthusiastic use of videos on iPads for modern teaching, whereas these videos are no different, pedagogically, to a real teacher presenting a class. Simply copying offline teaching approaches and pasting them into an online world is not only limiting the potential of educational technology, it is further damaging our tottering educational system. Ken Robinson called for a revolution in education because the system is failing. Schools are responding by pouring technology into classrooms. But what we're actually seeing is the silicon coating of old industrial paradigms and pedagogies while boasting about new innovative approaches. Dipping our kids in silicon by essentially replacing their chemical tablets with digital tablets will no more solve the problem than our first failed attempt at medicating our kids into learning did. We need to seek out appropriate guides who are attempting to understand the affordances of new technologies. We need to develop appropriate pedagogies that don’t simply copy offline approaches and paste them in skeuomorphic subservience into the digital world. We need to rethink, reimagine, and redesign how we teach and learn, otherwise the revolution may be over before it even begins. This post forms the basis of the thinking for the article published in The Conversation entitled "Outdated teaching methods will blunt technology’s power"
I’m signing the death warrant of the chalk, duster and chalkboard in Gauteng. We are moving on with the times and we are moving to better things. But is making technology available to schools without adapting curricula or teaching methods to a digital platform actually worthwhile? According to John Hedberg from the Australian Centre for Educational Studies, e-learning can only be successful if there is a “revolutionary move away from replicating traditional classroom-based teaching practices”. At the heart of Hedberg’s critique is the idea of skeuomorphism, which is keeping the form of the old but discarding its function. Think of smart phone cameras that “click” like a DSLR camera or pages in an e-book reader that “curl” as they are turned – just like a paper book. Thanks to Hollywood star Tom Hanks you can even make your laptop’s keyboard sound like a quaint old typewriter. Technology giants like Apple, Google and Microsoft have all used skeuomorphic designs to soften the transition from old technologies to new. These features don’t have any functional value but their resemblance to forms of the past gives users a sense of comfort and familiarity. 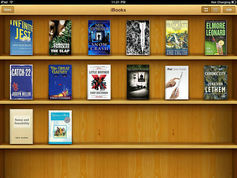 It looks like a bookshelf, but this tablet version is actually an example of skeumorphism. To increase instructor skills, we borrowed a technique from airline pilot training – simulators. Teaching in a virtual classroom requires knowing the basics of the technology and being ready to adjust … We watched each other teach and practised new approaches, testing what captured student interest. In 2011, Clintondale High School in Michigan became the global poster child for “flipped” classrooms. This is an exciting example of how educational technology can change teaching and learning if it is properly used and doesn’t just become a copy-paste substitute for old methods. A flipped classroom inverts traditional teaching methods. “Lectures” happen after hours, usually at home – students watch instructional videos at their own pace. During formal class time, students are given activities that help them engage with concepts. Rather than just standing in front of the class and reading from a textbook or tablet – what some theorists call the “sage on the stage” model – teachers become “guides on the side”, available to answer questions and lead discussions. Clintondale High’s combination of new technology and radically different teaching methods has pushed up its pass rates, improved discipline and seen more of its students securing college places. It takes completely new approaches to make technology an asset in the classroom. The educational technology boom isn’t limited to the developed world. It is growing rapidly in countries like India and Brazil. If teachers are exposed to new digital teaching approaches, and given the space to experiment with technology, we can begin to produce a whole new generation of pupils: those who think and create and not those who just sit in classrooms waiting to be told what they should do or know. In August 2013, the Los Angeles Unified School District launched a US$1 billion project designed to make its schools high-tech havens. A month later, officials discovered that nearly 300 students at one high school had hacked through security and were using their district-issued iPads to surf the Web rather than study. Then, in April 2015, it emerged that a digital curriculum developed by publishers Pearson and loaded onto pupils' iPads as part of the district’s ambitious project was simply “unusable”. Critics complained that the project had been rushed from conception to execution far too quickly and without any proper planning. Why wasn’t the technology pre-tested by the teachers who were expected to use it every day? Technology companies may understand the mechanics of their products, but it’s teachers who understand teaching and who must be involved in making those products more than just electronic white elephants in the classroom. Craig Blewett is Senior Lecturer in Education & Technology at University of KwaZulu-Natal.